Picks up 4, 6, 8, or 12" wafers (100, 150, 200, 300mm), solar cells, disk media, or flat, hard surface items. 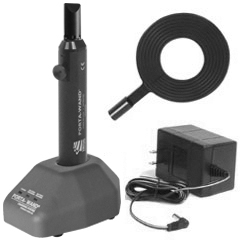 The Porta-Wand® kit comes with a fixed internal 9.6V NiMH rechargeable battery, in-stand charger and one ESD safe, wafer tip. Lifts over 500 grams. A PUSH-BUTTON provides easy on/off control and a "battery-low" indicator flashes when recharging is required. The internal air filter is replaceable from the front of the tool, and an internal exhaust filter ensures better than Class 1 performance. Rear exhaust of the pump air is standard. Optional wall mounting bracket is available. 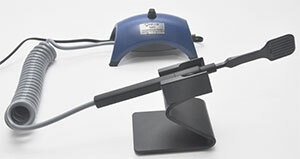 Approved power supplies include supplied In-Stand Charger; Universal 110-220V. Wall plug-in power supply 24 VDC @ 500ma. Barrel jack size 5.5mm OD x 2.1mm ID. 12" wafer model includes operational vacuum indicator that signals when it is safe to lift the wafer. 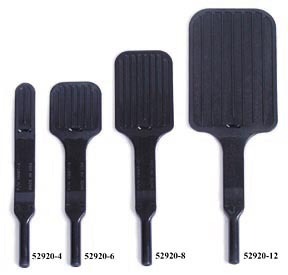 Picks up 4, 6, or 8 inch wafers (100, 150, 200mm), solar cells, disk media, or flat, hard surface items. The Porta-Vac II® kit comes with one ESD safe, molded wafer tip. Lifts over 500 grams. A disposable 9V battery is included. A large switch provides easy on/off control. A battery-low indicator flashes red when the battery needs to be changed or recharged. A switch setting on the bottom of the tool allows the selection of an alkaline battery or NiMH battery discharge characteristics for the battery-low indicator. A replaceable, internal air filter is accessible from the front of the tool. The Class 1 exhaust filter ensures clean operation. Rear exhaust of the pump air is standard. 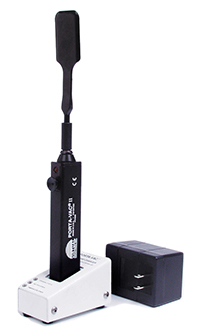 An optional rechargeable battery pack and 110-220V in-stand charger is also available. Minimum of 15 to 20" of mercury depending on elevation and atmospheric pressure. Add 0.62" (15.23mm) to the length when using rechargeable battery pack. with ExP Vacuum Wand Kit. The externally pumped ExP vacuum wand kits are a perfect and cost effective alternative to the Porta-Wand® and Porta-Vac II® systems; just use a suitable vacuum pump or an in-house vacuum line. 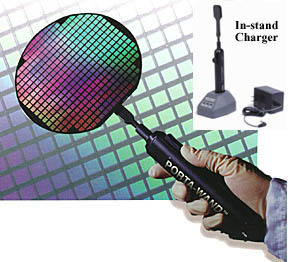 The ExP vacuum wand kits use the same size wafer tips as the Porta-Wand® and Porta-Vac II®. The ExP vacuum wand has a push-button to release the wafer. The kit comes with a wand holder designed to keep the push button depressed in order to close the vacuum line when the vacuum wand is not used. Comes complete with 1/8" ID coiled vacuum hose. The PELCO® Vacuum Pick-Up Pump (Product No. 520) can be used as vacuum source. These wafer tips are molded from ESD-safe PEEK plastic to handle wafers up to 100°C. 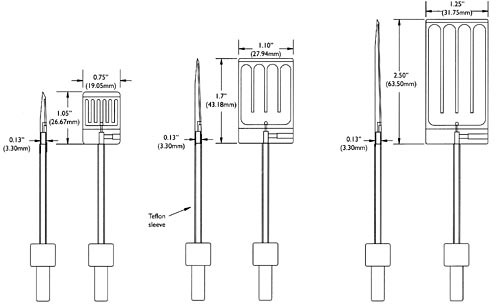 The low profile of the wafer tip head provides easy access to wafers in industry standard boats. These tips attach to all of our wafer handling tools as well as competitive systems. These wafer tips are made from precision machined hard anodized aluminum for high temperature applications up to 250°C (482°F). 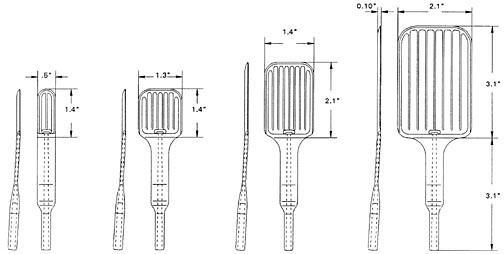 The wafer handling tips come complete with 3" (76.2mm) long. Straight, stainless 0.094" (2.39mm) diameter tube covered with a PTFE sleeve. 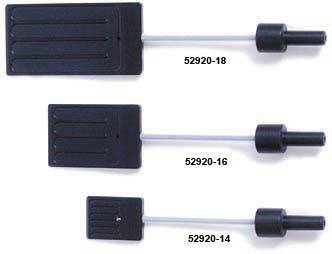 The press fit adapter is made from static dissapative plastic.